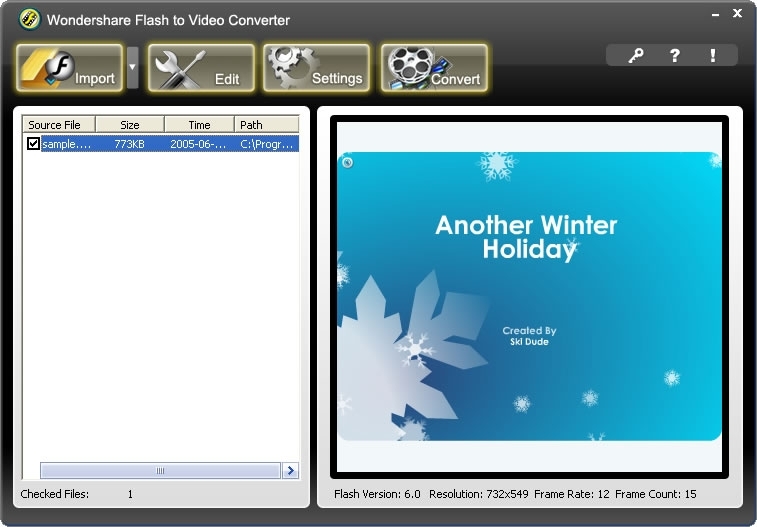 Wondershare Flash to Video Converter is an easy-to-use utility to turn your flash into video formats that could be played on iPod,PSP,Zune and Smart Phone. It is convenient for those who are trying to enjoy their wonderful flash everywhere. Wondershare Flash to Video converter is an outstanding software that converts Macromedia Flash to any other popular video formats that could be played on PC, iPod, PSP, Zune, and some Cell Phone. It provides plenty of methods to help you get high quality video. This powerful utility allows you to convert a serial of flash files in one time, and add a customized picture to the output file as a watermark to prevent the others to use your video without your permission. It can process many files in one time. 2.Save and use Flash that you have viewed in web pages. It can explore your cache file and find the flash you've ever viewed before. It will display the version, total frames, time length and some other information of the flash. You may put a customized watermark on the output file to prevent others using it without your permission. 7.Easy setting and nice interface. The setting will be done just in a few seconds and also able to meet your need.